Nobel Peace Prize winner Jose Ramos-Horta became East Timor's new prime minister Saturday, the president said, announcing the formation of a new government following months of violence and political instability. The tiny nation has been left without a functioning government since Mari Alkatiri resigned as prime minister last month amid allegations that he formed hit squads to kill his political opponents, a charge he denies. Many in East Timor blame Alkatiri's dismissal of 600 soldiers - nearly half the country's armed forces - for street battles that erupted in May in the capital, Dili, between police and army units and later spilled into gang warfare, looting and arson. At least 30 people were killed and 150,000 others forced from their homes. "Today I officially announce the new government of East Timor," President Xanana Gusmao told reporters after holding emergency talks with Alkatiri's ruling Fretilin party. 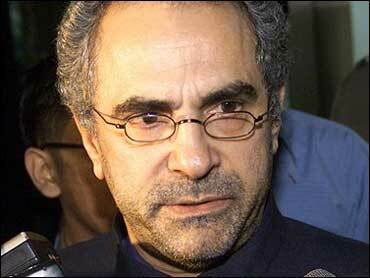 "The prime minister is Dr. Jose Ramos-Horta." Among the government's first jobs would be "restoring peace and stability and getting people out of refugee camps and into their homes," Gusmao said. Jose Ramos-Horta was just 25 years old when he became East Timor's foreign minister and fled his tiny nation days before neighboring Indonesia invaded in December 1975. He spent the next two decades in exile, earning a reputation as a savvy political operator and tireless fighter for East Timor's independence struggle, jointly winning the 1996 Nobel Peace Prize with Bishop Carlos Belo for his efforts. Three years later, people in the former Portuguese colony voted overwhelmingly to break from Jakarta's often brutal rule. There are hopes - now that Ramos-Horta has been named prime minister - that stability will return to the country of less than a million people after violence in May left at least 30 dead and drove around 150,000 from their homes. The greatest challenge, in addition to uniting rival factions within the security forces, will be forging political support within the ruling Fretilin party of ousted Prime Minister Mari Alkatiri. Without it, the new leadership could be short lived. Despite being a politician from a privileged background, Ramos-Horta has a rare following among the people of East Timor's rural districts, due to his personal charisma, powerful communication skills and contribution to the freedom fight. Mark Aarons, an author and political commentator who has followed East Timor since the 1970s and traveled with Ramos-Horta as a young man, said he single-handedly "kept alive the diplomatic hopes of the people who were struggling inside the country" during the occupation. "He lived long years in tenuity and poverty in New York to be close to the United Nations ... when others would have abandoned all hope," Aarons said Saturday in an interview. Ramos-Horta will head a transitional government until general elections can be held, probably early next year. In 1999, when Indonesian forces left after an estimated 200,000 East Timorese had died, Ramos-Horta returned to Asia and once again took up the foreign minister's job under Alkatiri in what proved to be a difficult political partnership. Ramos-Horta, 56, is one of a dozen children born to Portuguese-East Timorese parents. Four of his siblings died during the conflict. He was educated as a boy at a Catholic mission and later obtained a masters degree in peace studies at the Antioch University in the United States. He is fluent in East Timor's national language, Tetum, and Portuguese, English, French and Spanish. The father of one son, he divorced his former wife, Anna Pessoa Pinto, who served in the previous government as minister for state and internal administration.